The first Irish Natural Family Health Conference is an event that you might be interested in going to. Today we’re bringing you Siobhan Daffy and Niamh O’Connell who are organising the conference in Dublin this March 10-11 to tell you more about it. Siobhan is a Homeopath running Natural Rhythms and Niamh is Director of The Wellness Clinic. What led you to set up the Irish Natural Family Health Conference? Niamh: I was delighted when Siobhan approached me last summer about this. It was an idea I had been mulling over for a while in my head, but I wouldn’t have tackled this alone. I have been in the natural birth, breastfeeding, baby-wearing, co-sleeping phase for the last decade, and as I use natural methods to boost my family’s immunity and treat us when we are ill, I had visualised a coming-together of like-minded parents at an event like this for a while, it was a natural progression. Siobhan: I have had this idea in mind for a couple of years. It’s mostly come out of my own journey as a mother. I’ve taken my kids to a homeopath and a kinesiologist and occasionally an osteopath since they were babies and used natural supports during the births. I’m a homeopath myself but I took a break for years when they were young. I learned so much from watching other practitioners work and seeing what my kids did well on, what helped them physically, emotionally and socially to overcome difficulties. And how much it benefited them the more I looked at myself and my own patterns. Last summer I read Stella O Malley’s books and couldn’t stop talking about them. I wanted to meet her and I began thinking about what kind of event I’d like to attend myself and who I’d like to meet. I found Niamh on Facebook and I thought what she was doing was great and I wished I’d had her courses when I was at home breastfeeding and struggling with finding space for myself in the toddler years. So I approached her about running a workshop together or something similar and it evolved from there, the conference was born and grew legs. Everyone has been so enthusiastic about it, it’s very encouraging. What were you looking for from your speakers? Niamh: We knew we wanted to represent many different modalities of natural health care with our panel of speakers. Most of our speakers are parents too, which will make their talks relatable. We needed to respect them for their work, and gel with them personally to make sure the talks will all be practical and relevant. Siobhan: I feel really inspired about natural healthcare in Ireland at the moment and I’m excited to hear how each of our speakers works and how they are helping families build emotional and physical wellness with everything from garden herbs to fermented foods. We’re looking to be inspired by their experience and to share in their enthusiasm. We’re looking for their openness and willingness to be part of an new event. Niamh: People can expect lots of practical take-away information to bring home to benefit their family’s health. Each speaker will be covering different areas, from physical ailments to emotional issues and spiritual wellness. Self-care for parents and natural, gentle and traditional approaches to healthcare for children are on the agenda too. Siobhan: People can expect to meet other parents on the same journey as themselves and interested in natural ways to build immunity and resilience in their children. There is a great range of speakers so whether you are interested in naturopathy, garden herbs, homeopathy, nutrition, self care, fermented foods, emotional wellbeing or family dynamics – there will be something for you. You may come across new ideas and tips that will make your life easier or inspire you to try new avenues for yourself or your children. Niamh: Due to the limited space in this venue we have a “babes in arms only” policy. We are offering a transferable 2 day ticket so parents can take turns attending talks if they wish. Niamh: They most certainly can! We are aiming to support and showcase the fantastic Irish homegrown industries, from natural skin products to kitchen-table businesses, we have stalls to rent from as little as €35 per day, and are offering reasonable sponsorship packages too. Please contact naturalconference@gmail.com for more details. Can you give us a little take-away from this column to benefit our family’s health this flu season? Niamh: I make sure to home-cook as many meals as possible in this season, including garlic and lots of vegetables to boost immunity. As well as cutting down the sugar in our house, we are trying to get fresh air and sunlight, even on these short days. We are lucky in that homeschooling gives us some flexibility, so we are getting up and outdoors after breakfast most days. School-going families might try to walk/cycle/scoot to and from school if possible, the smallest of daily exercise all adds up to improved health. Siobhan: We’ve been having warm breakfasts in the morning to keep everyone fortified against the cold, we’ve had hard boiled eggs a lot or warm milk with cereal or porridge or sausages as a treat for those who go mad for them. I love soups and adding stock (if you are not vegetarian) is a great way of adding minerals to the body. Broths and stocks would traditionally be given to people during illness to build them up. I’ve been giving everyone a spoon of kefir every day too to keep the gut strong. I use homeopathic remedies where necessary for more specific treatment. 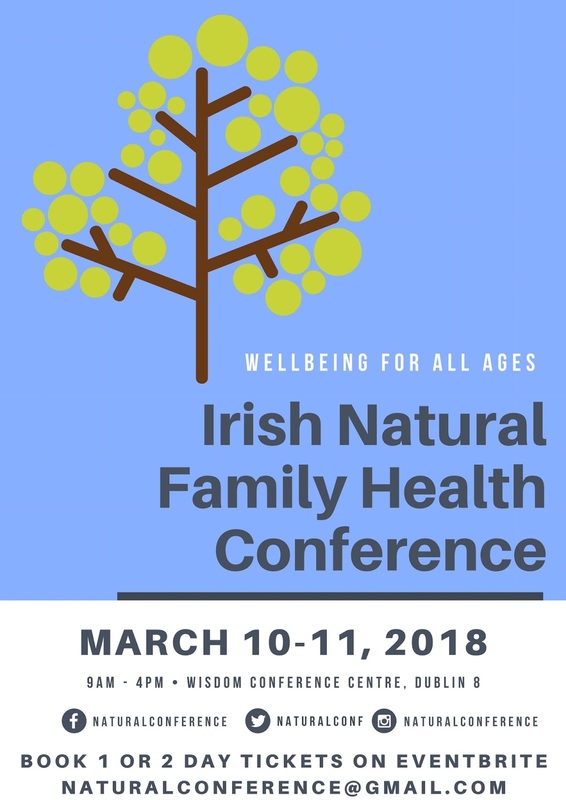 The Irish Natural Family Health Conference takes place March 10-11 in Dublin 8. One or two-day tickets are available on Eventbrite.